The only thing I’d say is that the icing recipe seems to produce enough for two batches. Amazing! I am glad you liked the recipe… Also buttercream freezes pretty well so if you didn’t want to make another batch of cakes then you could freeze the rest. Although, I think using it as an excuse to bake more is clearly a far better plan. Hiya, just wondering what kind of piping bag you used or whether you used a nitrous dispenser? (cream whipper) these look amazing! Just a regular piping bag and nozzle set from Lakeland (UK) no nitrous needed. do you think it would be possible to make a gluten free batch of these? Yes! I think if you used a GF self raising mix it should be fine. You might need to add a couple of tsp of milk because it can be quite absorbent. Oh my! Why am I only seeing this after I’ve had two days off? Np baking time until next week now….. Thank you for sharing this great recipe, made a batch for my parents anniversary party. They all disappeared really quickly & I got lots of lovely compliments. Reblogged this on pumpinglaura's Blog. Just making these. Gin in the ingredients for the cakes but you have omitted to add it to the cakes !! Am just having a cheeky g & t while I’m waiting for the cupcakes to cook. My icing looks a bit runny (my first real attempt at buttercream!) but I don’t think I’m too bothered. I hope the guys at Sunday Assembly tomorrow appreciate these! If the icing is runny, more icing sugar will always fix it, or you can cover it and stick it in the fridge will make it a bit firmer. These are amazing! i made some for a tea dance and they went in a second! Im now about to make a second batch for a BBQ for the same crowd that went to the tea dance……..guess Id better make double the amount if i want to actually get one! Having made these and loved them, I’ve turned my thoughts to other drink-based cakes, so I’m adapting this to make Brandy Alexander cupcakes – crème de cacao in the cake, brandy butter icing and a tiny sprinkle of nutmeg on top. I’ll let you know how it goes! Just starting these – pretty excited. Is your 170 degrees setting for a fan oven or non-fan? When I added the Tonic my mixture curdled has this happened to anyone else? Still going to bake to see what happens. Add a little more icing sugar, that will bind it together again. Curdling happens when too much liquid is introduced – you might have been a bit enthusiastic on the gin. Thanks for the recipe – loved them! I made these yesterday and they are absolutely gorgeous! Thank you so much and I have linked this recipe on my WordPress. 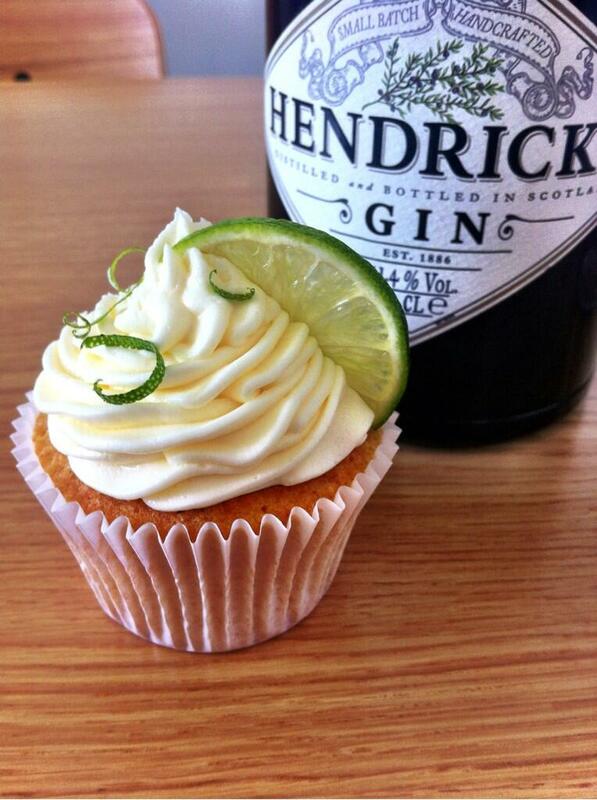 Do you put Gin in the cupcakes as well as the icing?? Was planning on baking these beauties tonight. Just bought the gin to make these beauties😊. Made stout cakes for Father’s Day, so G&T cakes for Father’s Birthday sounds perfect. Thank you for sharing. This recioe came up when I googled gin and tonic cupcakes. Wanted to comment so it would remain the first one😜. On my second batch, (giggle, giggle), I mixed the gin with some lime juice before brushing on the cakes a second (hiccup) time. I also added lime zest into the frosting. These are delicious! The sponge is so light, and the frosting tastes yum. I was generous with the piped icing but still had some left over, so could do 1/2 or 3/4 instead! Will syringe more gin into the sponge next time..! Hi, could you make the cakes the day before or do they get soggy? Also is the 170 fan forced? They are fine made the day before and shouldn’t go soggy – keep them in an airtight container. 170 is in a regular oven so you might want to lower is to 160 for a fan assisted. want to make these but not sure of the conversions from grams to cups.Can you help with this? Afraid not – we don’t work in cups in the UK. Maybe purchase a cheap scale? Thank you so much for this fabulous recipe, I’ve made these cupcakes numerous times now, always a great success, so much so I have been asked to make them for a local cafe who host gin tasting evenings, they went down a storm!!! Just made another batch of 48 for another gin tasting evening for a local Rotary club, they are awaiting the frosting as I write! As alcohol doesn’t freeze, would I be able to make ahead and freeze 😕? Made these a couple of days ago and they went down a treat. My personal tip – be brave on the gin if like me you are a bit of a gin fiend! I probably put about 3-4 tbsp gin in the end on the cakes – was pretty much pouring by the end almost like a drizzle – which as a bonus kept the cupcakes lovely and moist. But a great recipe – I am making these again for the office tonight. Might adapt the recipe to make some Grand Marnier cupcakes with Orange zest. Thanks again for a great recipe! Been meaning to leave a comment for ages, but I’ve been too busy baking! These are now a firm family favourite. When I asked my father what he wanted for his birthday cake, he asked for these cupcakes. And he got them too! Also, I’ve made the cupcakes the night before, and iced them the next afternoon, and the family swore they were the best batch ever. Just made these. Gin buttercream is a bit of a revelation, although mine split slightly and Im not sure why. Still tasted fab though. Couldnt really taste the tonic- think I would maybe brush some onto the cakes next time instead of gin? 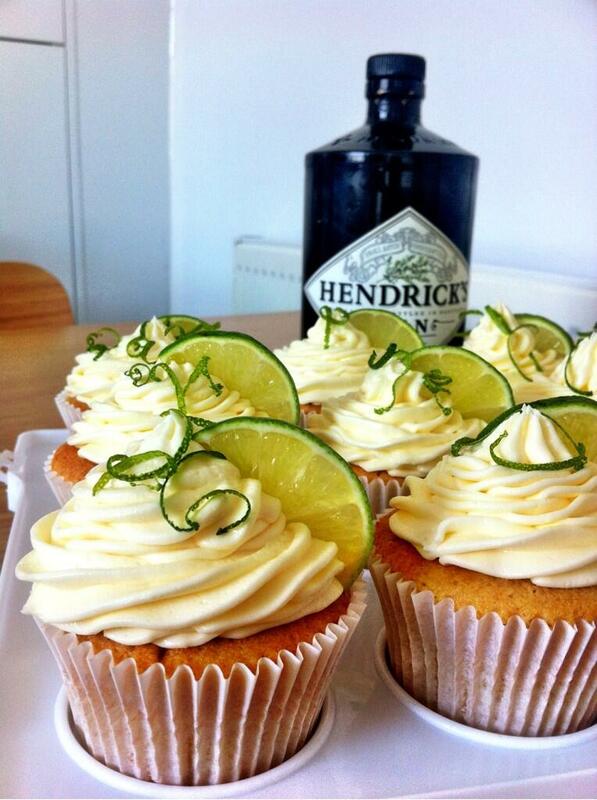 Or maybe just leave it out to be honest, and have gin cupcakes!